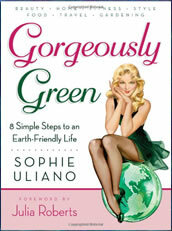 The Gorgeously Green Diet: How to Live Lean and Green was created by Sophie Uliano, who has appeared on Oprah and Good Morning America and is the author of the New York Times Bestseller, Gorgeously Green. In her latest book Uliano explains how you can enjoy healthy food, lose weight, and save money while protecting the planet. The main concept of the Gorgeously Green Diet is that you should select food on the basis of its quality rather than its content of calories or carbohydrates. Additionally you are encouraged to look beyond a food’s convenience and to consider the health implications and environmental impact of your dietary choices. Three different eating plans are provided in the book so that you can change your diet at a pace that works for you. Uliano offers beginner, intermediate and advanced programs, each of which includes a week of menu suggestions. In addition to dietary information the Gorgeously Green Diet includes instructions on how to make your own natural, inexpensive skin care and cleaning products, as well as gardening and recycling tips. Fruit, vegetables, oatmeal, quinoa, whole grain pasta, flaxseeds, walnuts, lentils, seafood, chicken, grass-fed beef, dark chocolate. The exercise plan encouraged in the Gorgeously Green Diet involves at least thirty minutes a day of intense physical activity such as walking, tennis or jumping on a trampoline. A variety of strength and flexibility exercises are outlined in the book and five of these should be done every day after your aerobic workout. A set of light hand weights and a resistance band are required. The Gorgeously Green Diet: How to Live Lean and Green retails at $16.95. Different program options allow you to progress at your own pace. Diet and lifestyle suggestions help to protect the environment. Provides useful information for dieters new to an organic lifestyle. Includes tips on how to save money preparing organic foods. Includes almost one hundred recipes. Can be followed as a long-term lifestyle plan. Website includes a variety of helpful resources. Will appeal mostly to female readers. Recipes do not include nutrition information. Some of the beauty products recommended contain potentially toxic ingredients. The Gorgeously Green Diet will appeal to women who want to enjoy the health and weight loss benefits of a natural, organic diet, while also learning how to make lifestyle choices that have a positive effect on the environment. By adjusting your diet to include a greater proportion of unprocessed foods, it is quite likely that you will lose weight on this program, however if weight loss is a goal it may be necessary to incorporate other strategies such as monitoring calorie intake.